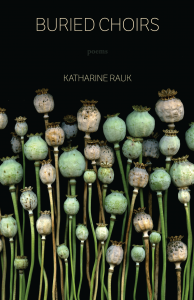 In her first full collection, Katherine Rauk takes us on a classic heroine’s journey, but with this warning – you may not find resolution, and if you do, it will be in the journey itself, which is tense, internal, and expansive. These poems borrow from a selection of archetypes and characters, both literary and historical, to examine the female experience, and they dismiss the upbeat societal narrative. Instead, they delve into women’s actual lived experiences to illuminate a truer storyline. Readers can intimate Rauk’s intent right from the cover. Her title is taken from the poem “The Clearing,” and the dichotomy of its words – “Buried Choir” – tells us that we are being invited to a world of voices that are both suppressed and uplifted. 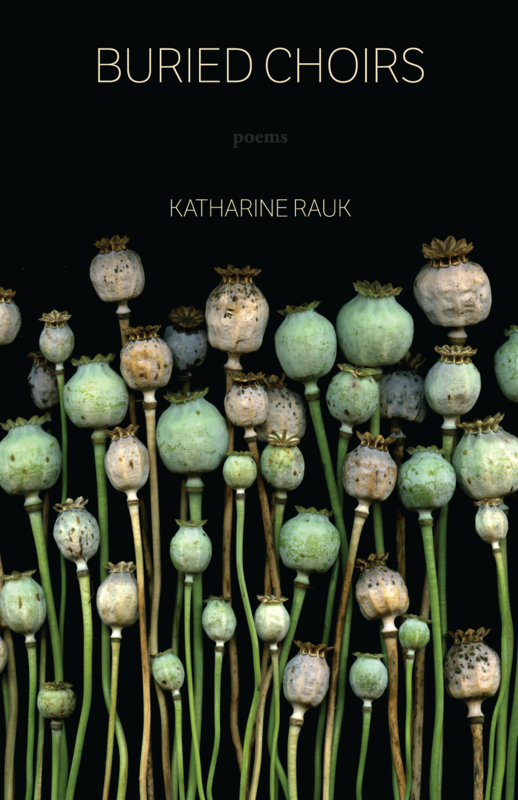 Fred Michel’s carefully selected cover art, “Papaver somniferum,” illuminates Rauk’s surface message of seasonality in the human condition. The skeletal seed heads are a Greek chorus, singing of the subterranean river that weaves its way through the book. The photo also hints at a deeper, more subversive message: knowledge is power, and it may be too dangerous for some readers. Papaver somnifeum is the infamous opium poppy. The flower makes an appearance midway through the book, with “faenas unfolding/in the black/bullrings of their eyes.” Balm for suffering, dangerous medicine, it is also a common garden annual. In a bizarre quirk of legal code, it is perfectly fine to grow this flower in your own yard – unless you know what you are growing. The mere awareness that your grandmother’s “bread seed poppy” is the same plant from which we derive heroin makes its cultivation a criminal act. These plants are our signal that Rauk is offering us an enticing but fraught condition of knowledge about ourselves and others. Caveat emptor. Rauk’s introductory poem, “A Preamble to an Explanation of You,”begins with a reflection on innocence. The speaker is remembering a time before life imbued her with the dubious faculty of experience. She is “a vacant elevator/opening and shutting uselessly on each floor.” We don’t see her path, “the conveyor belt of the ocean never carried me away,” nor do we meet any of the incarnations that will serve as teachers throughout the book. It does not take long, though, for Rauk to invite us onto her ferry. Allusions to rivers and dark waters abound, beginning with a direct reference to Charon, “the weight of that coin/I am always hiding beneath my tongue,” in “The Greatest Show.” This dark journey, these travails, will serve as guides to transform the speaker by story’s end. Inhabiting the terrain of free verse, Rauk toys with form, utilizing couplets or prose poems as suits her content. She stops the reader with forced caesuras in “Night Music” – “(a chorus) (a season) (an insect);” she forces us to dance between lines with enjambments that advantage hyphenated and compound words: “that can hitch/hike up the high/way of song to hot/wire the corpse,” or “Please pray for my crash/course in Small Engine Repair,” or “now and again to go black-/berrying...” Though she most often elects to break lines in accordance with sound, Rauk is not above displaying her own virtuosity. In a number of pieces, such as “Poem in the Shape of a Window or a Brick,” she skillfully justifies her lines to produce block poems, rectangular as newspaper columns.